Sometimes life just needs a little milk chocolate. Or in this case, a lot of milk chocolate. It is a good, good, thing. Plus, tis the season for truffles. Yes! 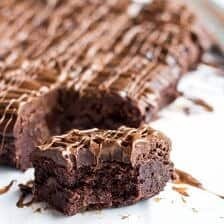 There is milk chocolate MELTED into the brownie batter, chunks STIRRED into in the brownie batter and then just a little MORE on top… to even it all out. They are the simplest of brownies, but they may also be one of the very best. They are the kind of brownies that can cure the worst of days. They are also the kind that almost every one will eat. Trust me, I know this. The three pans I made (yes, three – hey, I had to test them to make sure they really worked!) were gone by the end of the day. Completely gone. Three pans. Lately, I have been feeding an army of hungry teenagers. Hungry teenagers who get to snowboard all day……like as their job. Yeah, it is a thing and it’s legit. Oh, and they totally do not go to school either, but it is cool cause they are technically working. Yeah, working. 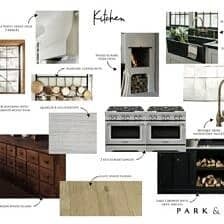 Anyway, they have all caught on that come twelve o’clock, four o’clock and eight forty-fiveish (we eat super late dinners) our kitchen is the place to be. Basically, it is complete madness at all hours of the day. The minute everyone walked into the kitchen and saw the brownies, literally scattered all over the kitchen (floor included), they began to devour them. This was the four o’clock hour – after snowboarding, so they were especially hungry, but still. Between the six of them the three pans were gone in minutes. They loved them. Even Kai, the die-hard picky eater who never likes any of my recipes (well, he did LOVE these cinnamon rolls and these burritos – but those are a given) thought these brownies were amazing. Honestly, I have never heard the words “these are so good” so many times in so little time. Normally, I get all annoyed when the boys invade the kitchen, but on this day they were saying all the right things. I can’t complain. Alright, so these brownies are SO easy. I adapted my usual recipe that normally uses all cocoa powder and added some melted milk chocolate, some instant coffee (because Averie told me to – the girl is a mad genius when it comes to baked goods – when Averie talks, I listen), some Kahlua and some more milk chocolate stirred in at the end. It is a MAGIC combo you guys, the brownies are thick, fudgey and just amazing. Then comes the truffles, or really the truffle layer. It has milk chocolate, peanut butter and a little Kahlua. This layer together with the brownie layer is pure brownie perfection. I mean really, easy and delicious, what more could you ask for! 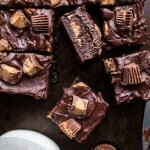 There is milk chocolate MELTED into the brownie batter, chunks STIRRED into in the brownie batter and then just a little MORE on top... to even it all out. They are the simplest of brownies, but they may also be one of the very best. To make the brownies. 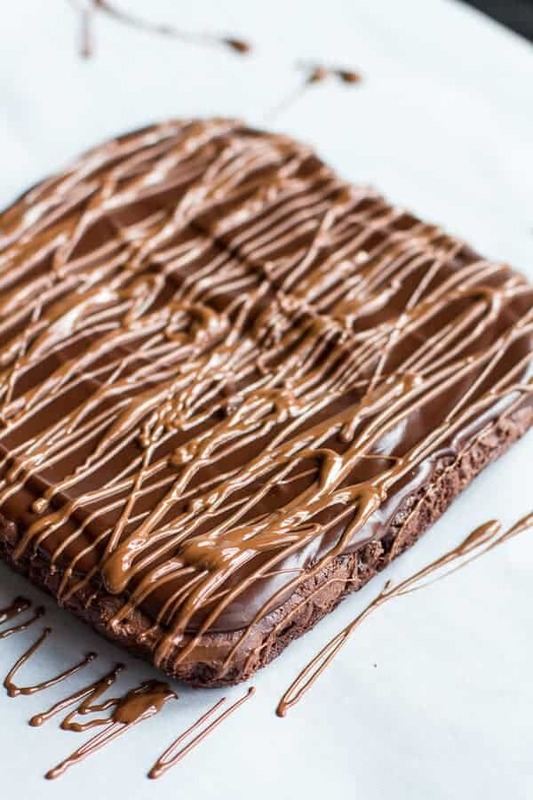 Line an 8x8 or 9x9 inch baking dish with parchment paper or foil, letting the edges over hang from the pan so you can easily lift the brownies out of the pan. Preheat the oven to 325 degrees F.
To the melted chocolate mixture add the sugar and instant coffee, whisking until completely combined. Add the vanilla, kahula and egg and whisk until smooth. Stir in the cocoa powder, flour and salt until smooth and just combined, try not to over mix the batter. It will be thick. Stir in the remaining 4 ounces chopped milk chocolate. Pour the batter into the prepared pan and bake for 25-30 minutes, until the brownies are set on top. Do not over bake, if anything under bake. Meanwhile make the truffles. Add the 3 ounces semi-sweet chocolate and the cream to microwave safe bowl. Microwave the chocolate and cream on 30 second intervals, stirring after each interval until melted and smooth. This takes me about 1 minute. Stir in the peanut butter and kahlua until smooth. Remove the brownies from the oven and let the brownies cool 5 minutes and then lift them out of the pan. Pour the chocolate truffle/ganache right over the brownies and smooth it out until it reaches the edge. 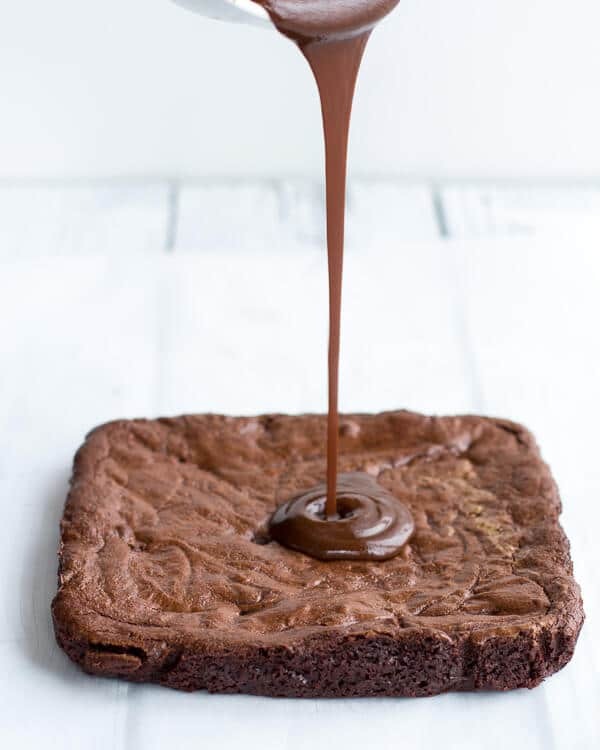 Melt the remain 4 ounces of milk chocolate and then drizzle it over the brownies. Allow the brownies to set at least one hour in the fridge or two hours at room temperature (out of the sun) before cutting. I personally like them best at room temp so everything is soft and fudgey. Oh my gosh. I love truffle season. 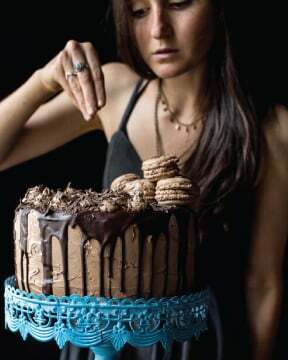 Fudgy Avocado Brownies with Chocolate Fudge Frosting + Video. Thanks so much for featuring these, Laura! Ahh you used the instant coffee in these! Excellent! And the color, texture, drizzles, everything about them makes me wanna dig in! Did you get my ping back? That stupid thing is so weird how it sometimes works and sometimes does not. No I didnt get it. It’s totally weird how pings work. Sometimes really obscure sites, I will get them, yet other times, nothing. But I appreciate the shoutout. And saw these on Tasteologie and Im sure they were on FG but I had no time to scroll thru today. They’re stunning! Coffee, Kailua, peanut butter – these are over the top. I’m adding this recipe to my must try list. Thanks! Tieghan, these look insane! 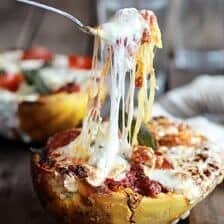 Must make these soon! These look so amazing I can’t even spell right!!! Pinning!!! Now this is the kind of brownie my husband would love. Chocolate, chocolate, and more chocolate is all him. OMG! These look absolutely incredible! Chocolate, Kahlua, AND peanut butter…oh my. My husband would freak over these! I just found Kahlua Cinnamon Spice liqueur at my local store – that would probably be a very interesting spin on this recipe. Thanks Molly! That Kahlua sounds incredible! Girl, you rock! These look amazing. I’m all about new brownie recipes. ~Chocolate Love~ sigh! Bah! These look soooo fudgy!! Yum! I didn’t know snowboarding for a living was an option. I may need to rethink my career decisions. 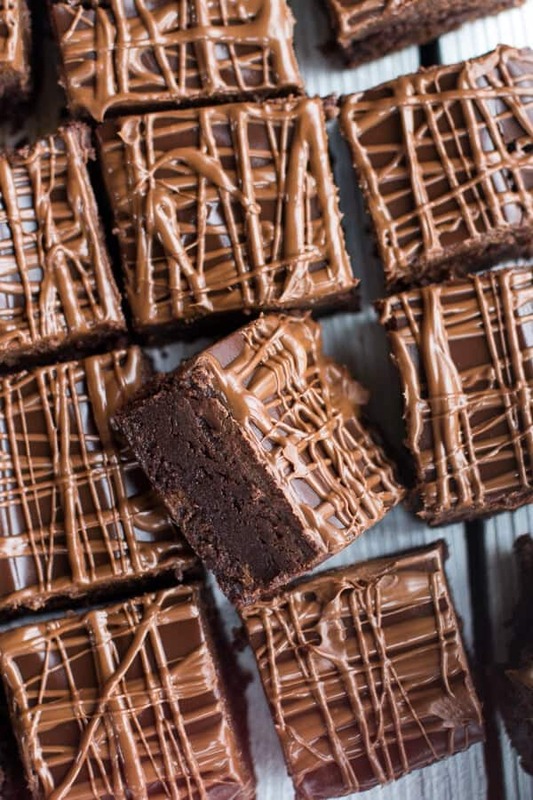 These brownies look insanely delicous. You can never have too much chocolatey goodness. Thank you, Jennie!! I agree, you can never have too much chocolate! I already feel my face breaking out just from looking at these, and I dont. even. CARE. Want them nowwwwww !!! Haha!! Thanks Christine! It is December, so maybe things are dry enough outside to keep the break outs a bay! LOL! Yess!!! Instant coffee or instant espresso powder is a MUST when it comes to chocolate baked goods. It just adds something special. And I’ve made an executive decision that there still isn’t enough chocolate in these brownies (kidding, of course…kinda). Haha! Thanks so much, Claire! Wish I could send you a pan! I love truffle season as well — like ALL YEAR LONG! These brownies are awesome. Thanks Meagan! I like your thinking! Yikes, these look dangerously delicious! Whoa, these are sneaky … I would’ve never guessed how much incredibleness is in these based on looking at them. Peanut butter, truffles (*swoon* love truffles) and brownies?! Get.Out. These are absolutely being pinned! I want to eat the entire pan and not even feel bad about it. Haha! It’s December, tis the season! These brownies sure could cure any bad day. They look so decadent and amazing!! And the fact that there is PB in there – I’m in heaven! This is decadence right here! WOW! MUST try! I’m pretty sure I’d be screaming “THESE ARE SO GOOD” from the mountain tops over and over again! I’m going skiing for the first time this weekend- these are so totally how I’d want to refuel! Have fun skiing! We are you headed? These look sublime. Normally I go for dark chocolate but sometimes you need some milk chocolate in there too! Thanks Mallory!! Dark chocolate is delicious too, but milk chocolate has its place! Dude, I am usually not a milk chocolate girl at all, but these things look absolutely INSANE. in a totally good way. Plus I have the sneaking suspicion that all the milk chocolate in this recipe can be swapped with dark chocolate, so now my life is officially wrecked. Hah! Yes, dark chocolate can surely be used!! I love dark chocolate too! These look amazing! 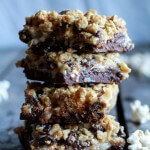 I am a sucker for a great brownie recipe and these look like they are to die for!! Pinned! 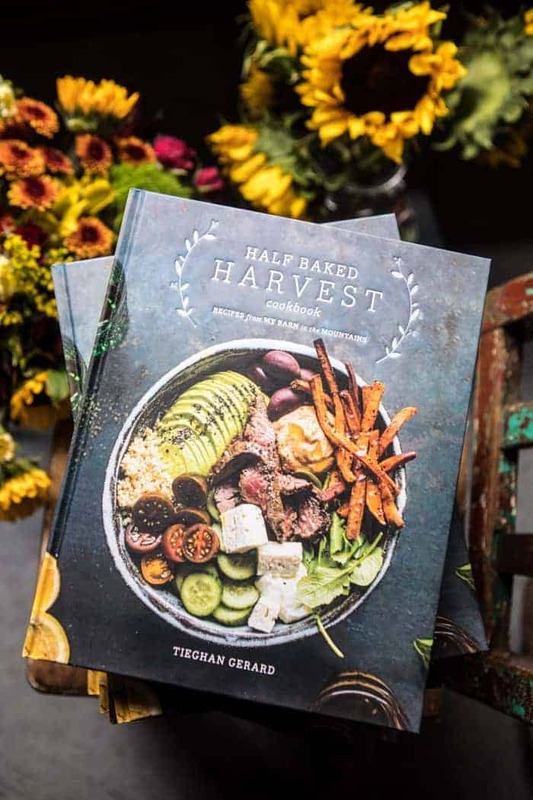 Tieghan, you temptress! Most days I can bypass chocolate no problemo. But there are those days — as I’m sure you can understand — where chocolate doesn’t stand a chance around me and I’ll inhale anything with a cocoa solid in sight! These brownies would totally be PERFECT on those days… or every day 🙂 you just may have converted me! These look so decadent! Definitely pinning! 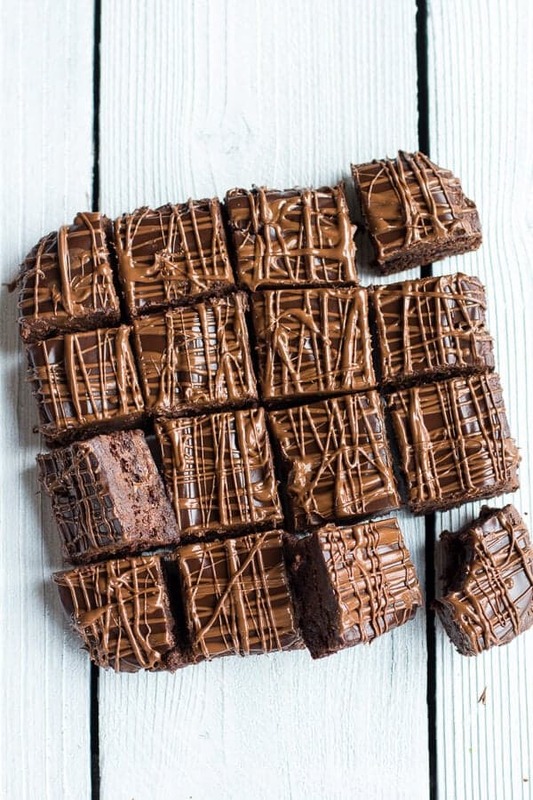 Gorgeous brownies, I need these in my life! Wait, what?!? How did I miss the fact that you are writing a book??! Huge CONGRATS!! I am so excited for you and me! Me because I cannot wait to get my hands on it! Chocolate heaven! I will take 2! Thanks Gaby! I was saying the same thing about your brownies last night! These are calling out to my inner chocoholic! I can’t wait another second without making these! 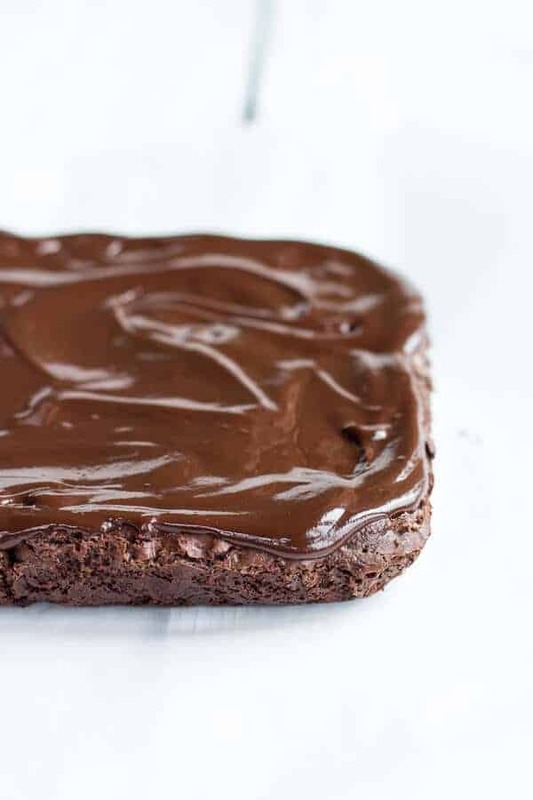 I can`t stop looking at the photo of this brownie, because it looks so appetizing! I used to buy this dessert in the shop, but now I see that it is worth trying to bake one. I’ve got the biggest chocolate craving now! 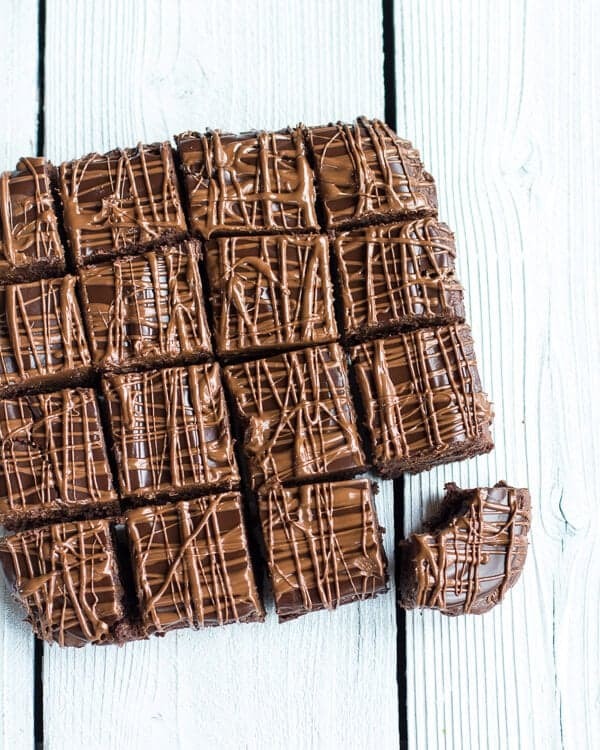 All I want for lunch today is 1 (or 2) of these gorgeous brownies. So moist and fudgy-looking—-Pinned it! Making these right now and have run into one tiny little difficulty. Baking temperature? Cannot WAIT to devour at least one of these! YIKES!! So sorry, it is 325 degrees F. Hope you love these! Okay, fine. I want one. I wouldn’t say no. Kahlua really is the best thing that ever happened to baked goods 😀 funny, speaking of pingbacks (from your comments section), I didn’t get one from this site (http://giraffesonskates.tumblr.com/) but I saw it in my referral stats for my latest Epic Dulce de Leche Brownies post and clicked…and then, oy vey, I saw your brownie photo and drooled. Almost literally. These look really fantastic! I can always use more chocolate in my life…bring it on girl!!! 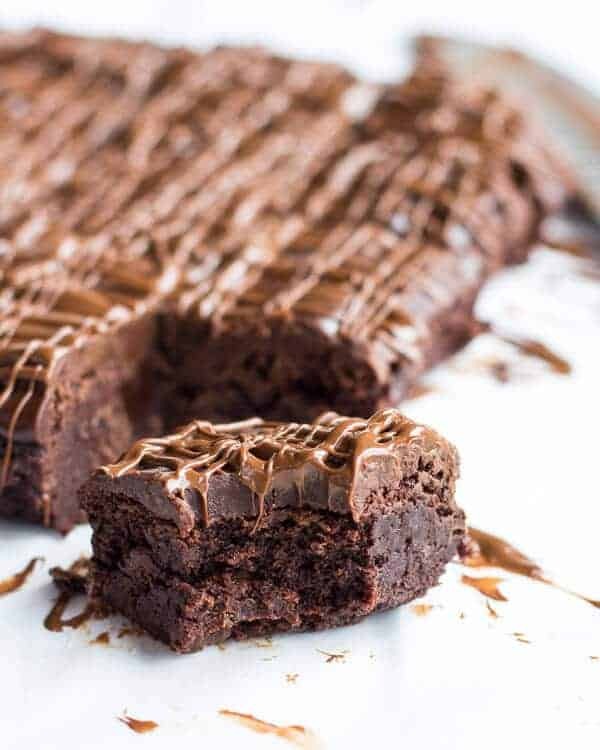 These brownies look sinfully good! Hmmm. I have no idea why that would happen. I tried it on my phone and nothing happened, but I will look into it. Sorry it was so annoying!! That totally stinks. Oh il fait super envie ! 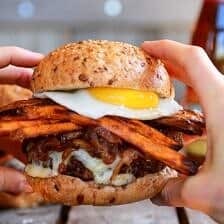 Great pictures – crappy recipe. There’s something terribly wrong! Followed exact ingredients and instructions produced chocolate soup at the end of 30 minute baking period. Baked more until no longer liquid. The glob did not hold shape when removed from the pan. The truffle topping soaked into the ‘glob’. Do not microwave the final 4 oz of chocolate by following the 30-second intervals as instructed for the Truffle! You’ll end up with a burnt mess after the second 30 seconds. Sorry they did not work for you. I make these brownies all the time and have never had any problems, but again I am sorry they did not work for you. I’ve made these twice so far and they’re PERFECT. Thank you for the recipe! SO happy you love these! They are my brothers favorite! 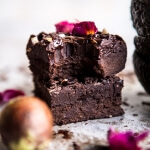 Hi there, I made these brownies a few days ago and oh my goodness they’re amazing! They’re so fudgey and yummy and the ganache does wonders too! I am embarrassed to admit that I just made two batches of this (I came across the recipe on Friday!) and am planning to make one (or maybe two) more this week. I did make some small changes. Three ounces of milk chocolate melted (because I misread the ingredient list). Brandy rather than Kahlua because that’s what I had. And a random mix of milk, semisweet,and dark chocolate for the ganache. (because I didn’t have enough semisweet). GREAT recipe. All the ingredients are normally part of the pantry. 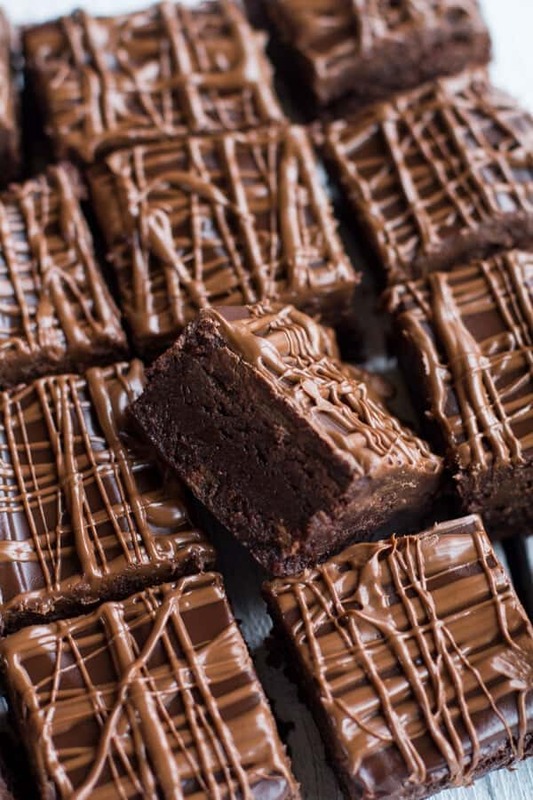 Dense and chewy brownie. Silky ganache. I thought when I read the recipe that there was too much going on with the Kahlua, the coffee, the vanilla, the peanut butter. No such thing. It all works together nicely. Thanks for a keeper! YA!! So happy you love these brownies. 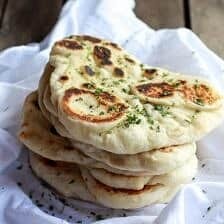 They are my favorite go to recipe for sure! OMG! These brownies were AMAZING! My husband loves peanut butter and chocolate so I made these for him today. Usually he tells me to give some of the desserts away so he won’t eat the whole pan, not with these. He said that he wasn’t sharing these. Only change I made was I drizzled melted white chocolate over the top instead of milk chocolate. Definitely a keeper! 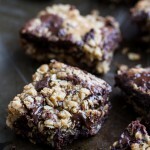 Question – I want to make these, but they need to be nut-free. Can I just leave the PB out? Thanks. Hi Anita! Yes you can just leave the Peanut Butter out! Let me know if you have any other questions! Made these today for Memorial Day family get together and boy it didn’t last long! True sheer madness with these decadent babies! Love love love the ideal of using kahlua! Really brought out the richness of the chocolate. Thanks for sharing the recipe. I founded in Instagram and had to try these out. Can I make this without the Kahlua? They sound soooo good! HI Annabelle! Yes! Just omit it from the recipe, no big deal. Let me know if you have questions. Thanks!! I made these for a group of friends last night. “OMG these are amazing” from all corners of the room. Thanks for this one! Yay!! So happy they were a hit! Thanks! Curious how full the flavor is with the peanut butter…is it a subtle hint? Or do you bite into it and definitely say, “oh there’s PB in this”? I’m not a huge fan of peanut butter desserts, but I also don’t like omitting things and messing with the beauty of a recipe ? So I left the PB in, as I didn’t get a response before I planned to make them. Good news, the PB is subtle. However, my bake time should have been increased. I love a fudgy brownie but with this bake time it was on the edge of not cooked enough. After letting them sit for the suggested 2 hours, I had to pop them in the fridge for another hour so they were firm enough to pick up and eat. So I would have increased my baking time…though with brownies it is so hard to find that line between undercooked and over cooked! Hi! The peanut butter flavor is not huge, but you can taste it. That said, I do think you can omit the peanut butter from the recipe. Hope you love these and happy New Year! This looks so delicious! So much for me cutting back on the treats. 😀 I think I’m all right with that though. Thanks for sharing! Does it matter what kind of milk chocolate is used? like Hershey or anything? By the way, this looks so good. I am planning on making it. And I was also wondering if I could leave the Kahlua out? But then I read the comments and got my answer. Nope, I think any milk chocolate will be great! And yup, kahlua can be left out. Hope you LOVE these! I tried this recipe for the first time last night and made three batches of it. This by far was yummy!! My entire family loved it. My aunt, mom, daughter, and husband. I did not disappoint anyone with his dessert. If anything, they would love for me to make it often for a treat. Thanks for the recipe!!! I am so glad these brownies turned out amazing for you and you enjoyed these Sasha! Thank you! This looks so amazing! Definitely better than any brownies I had in high school too! Thank you so much Kathy! I am so glad you loved these! These” brownies” tasted good, however they turned out nothing like a brownie. They were more lava cake like. Hi! I am sorry these did not turn out amazing for you. It seems to me as if they were not cooked long enough. Are you closer to sea level? Please let me know and again, I apologize that these did not turn out amazing for you!